The two expansions to Age of Wonders 3 have brought new races, a new character class, and (together with patches), assorted features and balance tweaks. They have also addressed my single biggest complaint with the game: the victory conditions (and their effect on pacing). Beat down the AI players to the point where they surrender (added via patch). 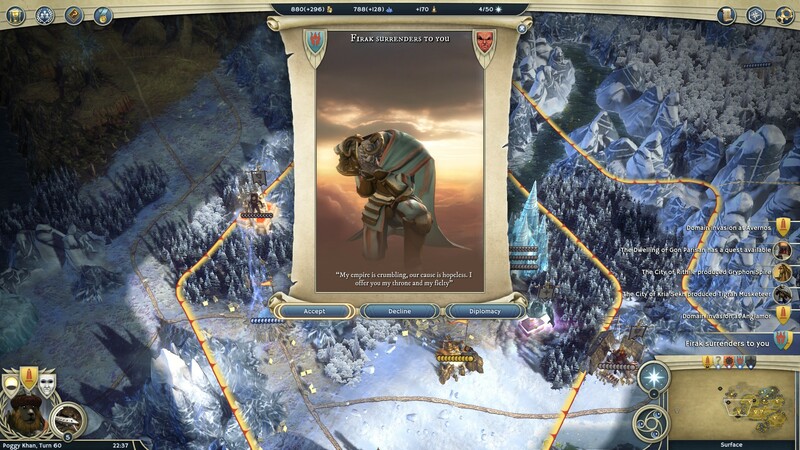 Per the developers, this is meant to happen after the “epic final battle… in situations where the AI is substantially outmatched and just lost a great number of its forces in a battle.” Based on the two AI players who surrendered after I crushed their multi-stack main armies, this works as promised! Territorial control, added in the first expansion. Similar to the Thrones mechanic in Dominions 4, this requires the player to take several “seals of power” defended by independent monsters, and hold them while progress towards victory ticks up. As the monsters periodically respawn, the seals have to be garrisoned – I suspect this is a risk/reward mechanic. Do you grab many seals, and risk spreading yourself too thin? Encouragingly, AI players do realise the importance of the seals; I lost my second game post-expansion when the AI flattened my armies and then captured the seals. A new, Wonder-style victory condition, added in the second expansion. I’m still getting a handle for this one; the developers describe it as “a great option for more defensive players”. Unlike the seals victory, aiming for this will provoke the AI players into declaring war, so it’s a defensive victory rather than a peaceful one. The heart of the game is still the tactical battles, which I still enjoy. The high point was fending off invaders with a mix of archers and upgraded tier-1 pikemen, while fast-moving humanoid tigers raced to take out their ranged troops. There has also been a unit rebalance — I have noticed that some of the game’s higher-level units (such as the Juggernaut, which I spammed back at launch) now seem best used in a support role, rather than as the core of an army. After playing two skirmish games, the new victory conditions have made me quite happy with AoW3 as a war-focused fantasy strategy game. If you enjoyed the base game, the first expansion is probably worth buying for the seals victory alone. Sweeter words were never said. 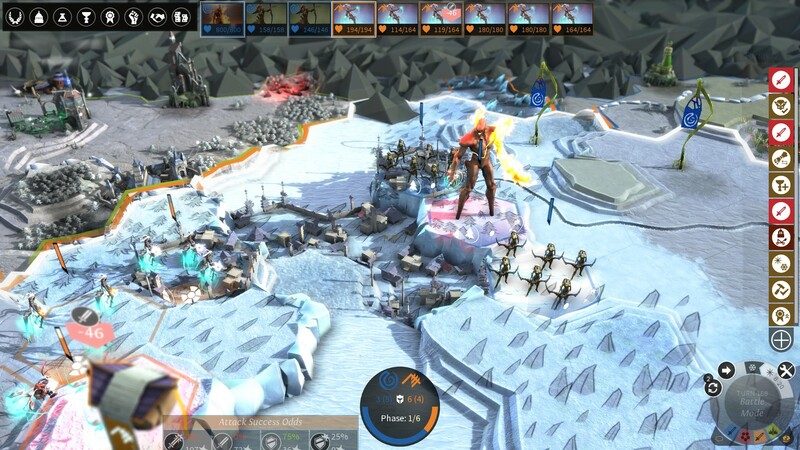 Endless Legend is a very different beast to AoW3 — less combat-centric, more of a 4X. It’s also my favourite of the two; I prefer its focus on peacetime, its music and art, its original world. Last year, I wrote that with some patches/expansions and a better late game, it could become a genre classic. After finishing my first game with the brand-new expansion, I think it’s well on that path. Whereas the new victory conditions changed the design of AoW3, the improvements to Endless Legend are subtler. Now, the diplomatic AI seems less erratic, more sensible — I cultivated an alliance that lasted to the end, even as we raced for the science victory. And I am pretty sure that the economy has been rebalanced; most advanced buildings now require special resources to build, and I don’t think that was the case at launch. That is significant — the resource system is one of the best elements of Endless Legend1, and now it feels better integrated into the rest of the game. Previously, resources were only (I believe) used by the military, and early-game resources became obsolete once better resources were discovered. Now there is a “guns or butter” decision about how to allocate resources, and early-game resources retain their scarcity (and importance). In consequence, city building stayed interesting for most of the game. I couldn’t spare the attention for the global quests. And it took me a while before I could afford world wonders. It did feel good to finally splurge on them! At this stage, my impression of the Endless Legend expansion is “nice to have”. If you like the game, go ahead and grab the expansion. If you haven’t played yet, give the base game a try (post-patch, this is a great time to jump in) and then upgrade if you enjoy your first game. The giant flaming guardian is less overpowered than it looks.